On January 1, 2019 it was exactly 60 years ago that the Cuban people, led by the Castro brothers and Che Guevara, put an end to the dictatorship in their country. Sixty years ago the Cubans wrote history. With a few hundred rebels, they defeated the best-trained army on the continent. They chased the Yankees from their island and managed to build a socialist society under their nose. Against all expectations, they held out against the military, economic and diplomatic aggression of the greatest superpower ever. The Cuban revolution put an end to the pessimistic theory that a progressive and sovereign course is impossible in Uncle Sam’s backyard. In 1961 they inflicted an insulting defeat on US imperialism in the Bay of Pigs. The White House has never been so humiliated by any Latin American country. A quarter of a century later, at the request of Angola, Cuban soldiers delivered thousands of miles away from home a final blow to the much better armed Apartheid army. In this way, a small, insignificant island helped determine the freedom of Mandela and the history of Africa. Together with Venezuela, Cuba was the driving force of the integration of the Latin American countries (Alba, Celac, Unasur), sapping Washington’s grip on this region. The Cubans withstood the longest lasting economic blockade in world history. Over a period of 30 years, they lost their most important trading partners twice. For most economies, this means a fatal blow, but they survived it without major social upheaval. Like any third world country, Cuba is facing serious economic problems. But as the graph shows, the results are anything but bad compared to the countries in the region. 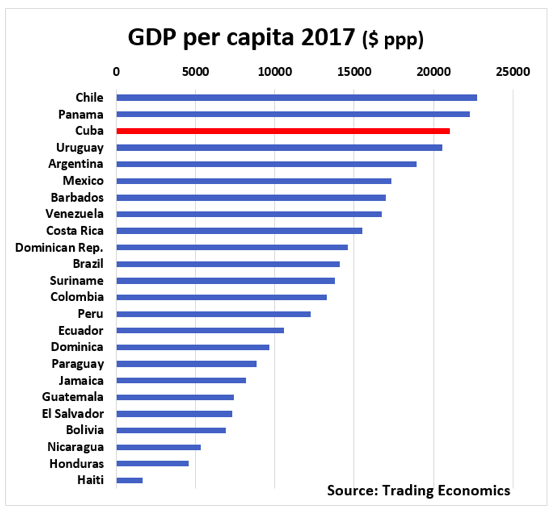 Without the blockade and without the fall of the Soviet Union, Cuba would now have a per capita GDP comparable to that of Italy. Due to its colonial past, the economic blockade, the lack of important natural resources and the fall of the Soviet Union, the country remained economically a third world country. Nevertheless, they managed to reach a social, intellectual and cultural level that is among the best in the world. 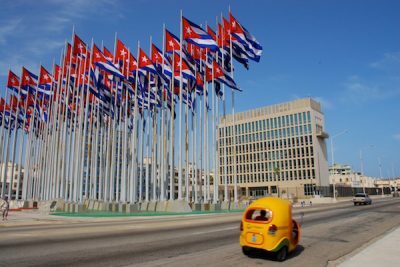 Through trial and error, Cuba has succeeded in building a different social project in which the focus is not on profit, but on the development of the population. If all Latin America countries offered the same medical care and social care to their inhabitants as Cuba, 130,000 fewer children would die each year. According to UNESCO, the level of education in Cuba is head and shoulders above the rest of Latin America. Cuba also plays a leading role on the continent in terms of gender, diversity and LGBT rights. Cuba does not only take care of its own residents. “Solidarity is the tenderness of peoples”, said Che Guevara. The Cubans are impressively highlighting this. Currently, Cuba has around 50,000 Cuban health workers working in more than 60 countries, half of whom are doctors. Another 20,000 doctors from 123 countries have been trained for free since 1998. Cuba sends out more doctors worldwide on its own than the World Health Organization. If the US and Europe were to make the same effort as Cuba, they would together send 2 million doctors to the world and would have trained more than another million over the last 15 years. The shortage of health workers in the South would be solved overnight. In 1992, at the Earth Summit in Rio, Fidel Castro was the first state leader to warn against the extinction of the human species. He advocated a radical ecological change. That turnaround was realised on the island. Today Cuba is the only country in the world that combines a ‘very high social development’ (Human Development Index) with a low ecological footprint. Our economies and our political system are dominated by multinationals and large capital groups. In Cuba, this power has been broken and replaced by the CTC, the umbrella organisation of the various trade union federations. There is no doubt that decision-making processes in Cuba are centrally guided to a large extent. However, this is compensated by a form of direct democracy. In addition to five-yearly parliamentary elections, there is a fairly unique consultation system. For all important decisions, the population is consulted extensively and a consensus is sought. In Cuba no measures are taken without broad support. This explains, among other things, why the Cuban government, despite sometimes very difficult circumstances, can still count on a great deal of support from the population. If my country, Belgium, had this system, a wealth tax would have been implemented long ago and the retirement age would not have been raised to 67 years. In capitalist countries, public debate is mainly conducted inthe media, or more correctly bythe media. It is the mass media that determine the outlines of political debate. These media are largely in the hands of large capital groups and have primarily commercial motives. In Cuba, the grip of the consciousness industry has been broken and mass media are in the hands of social organisations or the government. However, this does not prevent the Catholic Church, for example, from publishing various magazines and publications and from having its own websites, where you will find very different views and strong criticism of the official positions. However, the question arises whether Cuba should not organize more contradictory debates on television and in the newspapers. It should be kept in mind however that the social debate is not conducted in or by the media, but in the neighbourhoods, in the workplace, in the trade unions, in women’s and youth associations. In any case, in Cuba the Western consciousness industry has little or no control over the population, which means, for example, that Cuban women have no complexes about their bodies. Because of the social achievements at home and the role Cuba plays abroad, the Cuban leadership enjoys particular prestige in the countries of the South. On two occasions, from 1979 to 1983 and from 2006 to 2009, this tiny country was allowed to chair the Non-Aligned Movement, an organization that groups two thirds of all countries. In 2014, Raúl Castro chaired Celac’s second summit. For this meeting, 30 of the 33 heads of state of Latin America and the Caribbean travelled to Havana. It is evident that mistakes have been made in the past 60 years. Just think of the humiliating treatment of believers and homosexuals at the beginning of the revolution, the economic derailment of 1970, the failure to diversify the economy, the delayed changing of the old guard by a younger generation, and so on. The Cubans themselves are the last to claim that their journey has been without problems. Cuba is perhaps the only country to name a period in its recent history after mistakes made: the so-called ‘Campaign of Rectification of Errors and Negative Tendencies’ (1986-1989). Many weaknesses and problems remain to be addressed. Perhaps the most important challenge is this: the high level of social and intellectual development creates high expectations among the population. But there is no economic basis for this, and that leads to frustration. This is reinforced by tourism. A tourist apparently seems to be able to afford everything while he or she is not necessarily better educated. This is closely related to another phenomenon. Due to the collapse of the currency after 1991, wages no longer represent much. As a result, there is no longer a real link between labour, salary and purchasing power. This is very detrimental to labour motivation and productivity. It also causes corruption and discontent. The only answer is accelerated economic growth, but that is easier said than done. Since 2006, Cuba has recorded an average annual growth rate of 3.6% compared to 2.7% in the rest of Latin America. The foreign context is also a strong determinant here. Will Trump take a collision course or will he not get beyond tweeting? How is the situation in Venezuela and Latin America evolving? Whether or not the new large port near Havana will be a success will depend on this. What will be the impact of the increasing number of droughts and devastating hurricanes? There are also positive developments. Relations with Russia, China and the European Union are better than ever. The future will show whether Cuba will be able to solve these challenges. In these times, with the rise and spread of alt-right, solidarity with a country that, for 60 years, has demonstrated ‘the tenderness of peoples’ and where the focus is on people, not on profits, is more necessary than ever. Hasta siempre!